Some do-it-yourself jobs are just plain easy. Changing out the license plate bulb on your Audi is one of them. Keep reading to find out how. This article applies to the Audi Q5, A3, A4 B7, A4 B8, A6 C5, and A6 C6 (2009-Present). 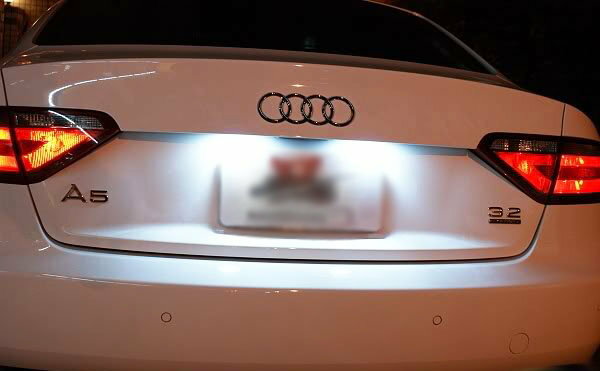 The license plate bulbs on your Audi are there to ensure motorists traveling behind your vehicle at night are able to quickly and easily identify your license plate number. It also serves as an additional light source to illuminate your presence on the road at night, whether identifying your license plate number is necessary or not. While your license plate bulb should last you a long while, there is likely to come a point in time when you'll need to change out an old, blown light bulb for a fresh, new one. The procedure is quite easy and requires just 20 minutes (or less) of your time. 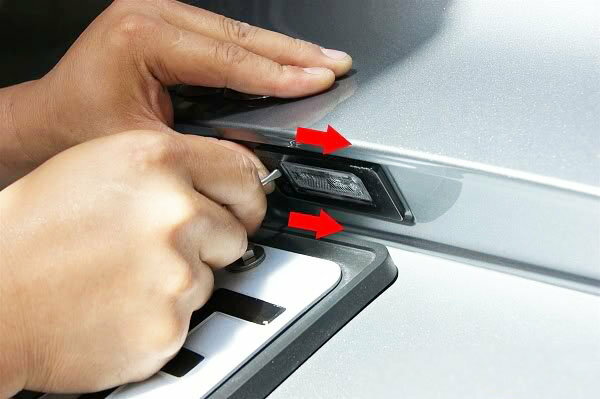 It's recommended that you complete this do-it-yourself project in the daytime, when you can see clearly and be able to easily remove the light housing connected to your trunk door. Let's get started! Standing at the rear of your Audi, with your trunk door pulled open and lifted all the way up toward the sky, go ahead and grab a flat head screwdriver. Press the screwdriver into the lip of the housing and then apply light pressure as you move the light housing in the direction of your right headlight. The housing should pop out easily, allowing you to access the socket. Figure 1. Go right with gentle force. If you experience any difficulty, try moving the light housing to the left, allowing it to drop slightly from the housing, and then push it back in the opposite direction to completely unseat it. Release your light socket by pressing down on both end points. This will free the light housing completely, allowing it to drop into your capable hands. 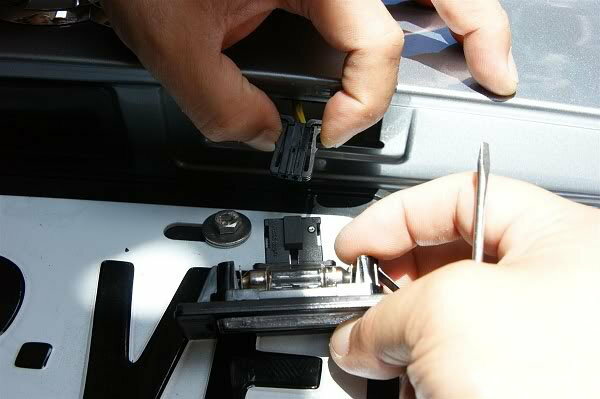 The socket will remain attached to your Audi, as depicted in the photo seen below. Figure 2. Release the socket. Go ahead and remove your old light bulbs and install your new ones. You won't need any tools. Simply pull the old light bulb out, and snap the new one into place. If you do experience some difficulty, you might want to wedge a screwdriver into the back of the light bulb (the screw or pin base) and use it to ease the light bulb out of the housing unit and into your hands. Re-install the light housing when you are done. Figure 3. Presto! You're done. Audi: Why Aren't My License Plate Lights Working?